JACKSONVILLE, FL, Jan. 22, 2019 (GLOBE NEWSWIRE) -- Drone Aviation Holding Corp. (OTCQB: DRNE) (“Drone Aviation” or the “Company”), a manufacturer of tethered drones and lighter-than-air aerostats, today announced that it has concluded U.S. Army operator training on the newly delivered Winch Aerostat Small Platform ("WASP") Elevated Relay System (ERS) at a U.S. Army base in the Pacific ocean. 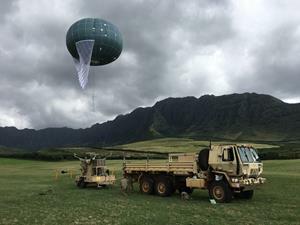 Delivered to the U.S. Army in October 2018 under a $1.7 million contract award, the WASP ERS is the latest generation of tactical aerostats. The state-of-the-art WASP features simultaneous multi-mission capabilities for extended range communications up to 40km. This capability utilizes multi-frequency and multi-wave form radios operating in parallel with high performance ISR payloads designed for day/night Intelligence, Surveillance and Reconnaissance (ISR) missions. This award was the third repeat order for the WASP by this customer and is the result of a growing number of successful international deployments with military personnel. “We are proud that our team was able to work closely with our Army customer to complete the soldier training on the WASP ERS’ enhanced multi-mission capability. This is the third WASP order from this customer, a testament to the positive feedback we continue to receive from the soldiers, and we look forward to further meeting their evolving mission requirements and supporting their future operations,” said Jay Nussbaum, Chairman and CEO of Drone Aviation.